I have noted on occasion that mass beaching of whales has been a sign of seismic activity to come. Just like increases in UFO activity before tremors, when whales get stranded on or in close proximity to the shore this activity may on occasion be a serious warning of earthquakes, volcano activity, etc. Mr Berkland says when this occurs; it interferes with sea mammals and even migratory birds capacity to navigate properly. 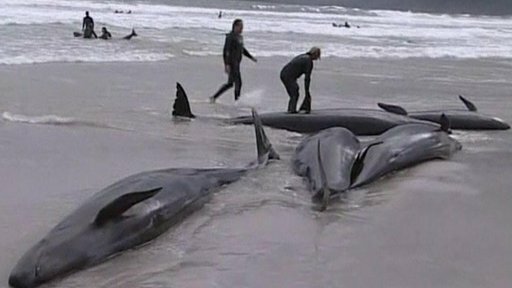 This phenomenon would therefore appear to explain mass beaching of whales. The latest beaching behaviour appears to be what may be Scotland’s biggest ever stranding, as a significant number of pilot whales were recently witnessed at Loch Carnan. Whale rescuers said they are looking into the hypothesis that the creatures’ navigation may have been affected by the magnetic field emitted by a cable that runs from Loch Carnan, where some whales were recently found, to the mainland. The whales appear to know that something radical is happening beneath the planet and understandably wish to get away from it. Either that or they are confused and alarmed by unusual magnetic or auditory signals that we humans fail to perceive. Such sensitive creatures are quick to note imbalance in their environment. They of course have to be this receptive to change in order to merely survive. Sadly, many so-called ‘experts’ cannot understand this natural fact of life. Following the above whale behaviour Grimsvotn Volcano in Iceland became increasingly active. An ash cloud from it is expected to reach the UK by the early hours of Tuesday (24 May 2011) morning, according to the Met Office. The Icelandic Met Office said the ash cloud may breach north-west Scottish airspace on Monday (23 May 2011) evening, reaching about 20,000ft. Some experts also alleged that sick whales are frequently followed into shallow waters by healthy ones. This of course may be quite true due to their strong social bonging instincts. However, mass beaching may, I feel, be related more generally to seismic activity and the desire to escape such risk. Active volcanoes are believed by some researchers to transmit auditory signals that can warn anyone who may be listening. These low-frequency acoustics are a principally unexploited resource for volcano monitoring. In view of this, whales may just be getting a much clearer sensation of what is happening beneath Mother Earth than we are. Let us hope that further earthquakes will not be on the cards, along with increased volcanic activity.